In the first two decades of the twenty-first century, the events of 9/11, 7/7, the War on Terror and the Caliphate and atrocities of the so-called Islamic State have dominated Western consciousness and wreaked havoc in parts of the Muslim-majority world. In their wake, a spate of books has been written explaining the phenomenon of Islamist radicalisation and Jihadism. Nevertheless, for normal citizens, as well as scholars of religion and legal professionals, the crucial question remains unanswered: how is mainstream Islam different from both Islamism and the Islamist Extremism that is used to justify terrorist violence? In this highly original book, which draws upon the author’s experience as an expert witness in Islamic theology in 27 counter-terrorism trials, the author uses the idea of the Worldview, as well as traditional Islamic theology, to answer this question. The book explains not only what Mainstream Islam, Ideological Islamism and Islamist Extremism are in their broad philosophical characteristics and theological particulars, but also explains comprehensively how and why they are both superficially related and yet essentially and fundamentally different. 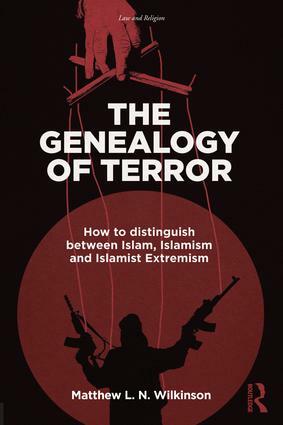 In so doing, the book also illuminates the cast of characters and the development of their ideas that constitute Mainstream Islam, Ideological Islamism and the Non-Violent and Violent Islamist Extremists who constitute the Genealogy of Terror. Chapter 8: A Second Age of Extremes or a Second Age of Enlightenment? Matthew L. N. Wilkinson is Senior Research Fellow at SOAS, University of London, and Associate Research Fellow of the McDonald Centre for Theology, Ethics and Public Life at the University of Oxford. He is Principal Investigator of Understanding Conversion to Islam in Prison programme, which researches the causes and consequences of conversion to Islam in prison and how inmates can derive rehabilitative benefit, and avoid any danger, from this religious choice. He has acted as an Expert Witness in Islamic Theology and Law in 27 counter-terrorism trials. His previous book, A Fresh Look at Islam in a Multi-Faith World: A philosophy for success through education (Routledge, 2015), was awarded the Cheryl Frank Memorial Prize (2014) as the most "creative and innovative" work of critical realist philosophy.